Traditional VIVDS cameras are the weak link in video detection performance. The lenses gets dirty, they get knocked out of alignment due to the wind, the connectors fail, the power supplies fail, and they leak water. The unique architecture of the multi-patented ITS Plus camera solves these historic maintenance and performance problems. In addition the above features our new Lightning Series offers Optical Mask Technology (OMT). OMT blocks bright light sources (sun, vehicle high beams, glare) while producing high contrast edges on moving vehicles. OMT outperform thermal cameras at every turn with the ability to see through fog, snow, rain and smoke – even detecting vehicles in complete white out conditions. The combination increases vehicle detection performance while improving ease of setup. In 2019, any agency that has never tried an ITS Plus product may trade in their traditional cameras for an ITS Plus Lightning Series camera with OMT for only $399. There is no limit to how many cameras you may purchase during our one year introductory offer. When an ITS Plus camera is installed with any video detection card (e.g., Traficon, Iteris, Peek, Econolite), two things happen: maintenance drops to near zero, and performance increases. 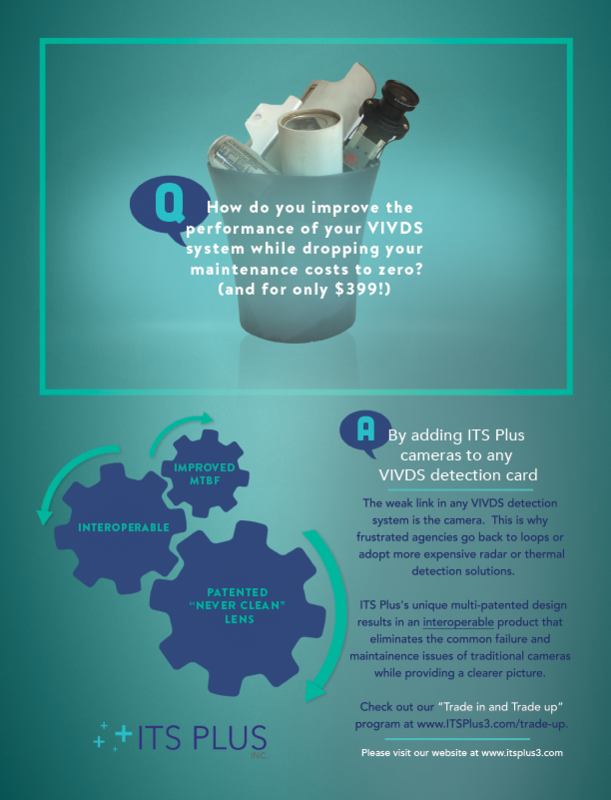 As your traditional VIVDS cameras fail, trade up a low maintenance, high performance ITS Plus Lightning Series camera with OMT and see the difference for yourself. You will be glad you did.